Most of the reference books I've seen on this subject are penned by Doreen Virtue, and I own more than a few. In "Signs From Above", there are frequent mentions that our guardian angels are always with us, and continually giving us messages through such signs as rainbows, found feathers or coins, and even repetitive number sequences. If any of this resonates with you, then remind yourself to start noticing your intuitive thoughts and feelings as well as the more concrete messages. Perhaps in doing so, you will send the message that you are open and receptive. I believe in asking directly for the guidance and protection you seek. This alone creates a shift in receptivity that in my experience has made all the difference in how I interpret the sometimes subtle array of signs. Ask .... and ye shall receive. 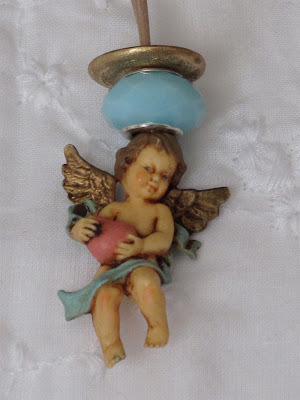 I adore these little angel amulets -- you are so clever! p.s. love this angel amulet! These angels look so cute mom!!!! Thank you for this wonderful post. I am in the process of plotting an angel novel and found your words both heartfelt and inspiring.